We live in a small town. So small that most of the people I know leave their doors unlocked, which I think is crazy. They think I'm crazy because I'm completely the opposite. I've always been overly cautious when it comes to locking my doors in the house and in cars. I think it's just me being normal. And even with our city being listed as one of the top safest cities in Ontario, you just never know. That's why I think that the Rogers Smart Home Monitoring System would be perfect for those of you who are like me, wanting a little more reassurance other then your hubby's word for locking the doors right before bed. I have to admit I have a need to check all the doors even if he says he locked them, lol. Most of the times the doors are locked, I just need to see it for myself. I don't know about you, but that seems pretty awesome prize and would definitely give me peace of mind! 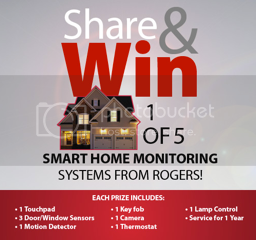 So if you would like a chance at winning one of five of Rogers Smart Home Monitoring System and live in Ontario, go ahead and enter now before it's too late. Remember you can get more ballots by sharing this contest to your friends via email, facebook and twitter! Contest Period: starts at midnight on March 1st, 2012 and continues until 5:00pm EST on May 16th, 2012.